I do this next to my regular office job. My grooming salon, a small but quiet room at my house, is located in Amsterdam Zuidoost, Montfoorthof, close to highways A2, A9 and A10 and metro station Reigersbos. Within my service areas (see below) I also do house visits. Payment methods: PIN, invoice, cash. 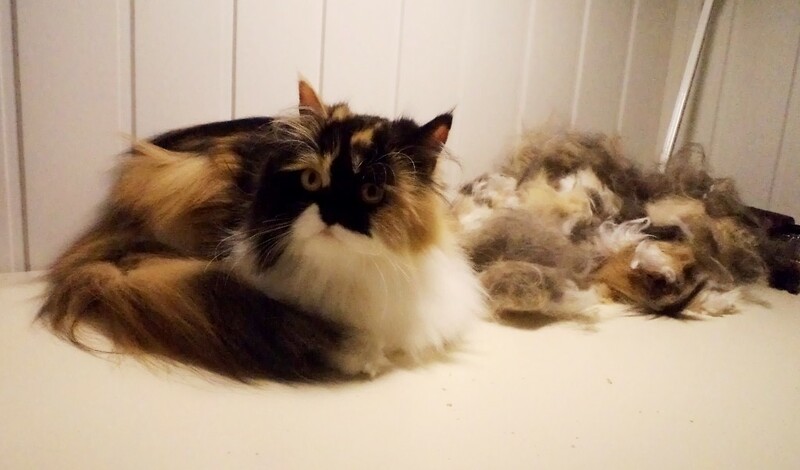 If the cat has mats that can’t be detangled, or felted fur, the coat will be shaved off. Head, tail and legs will not be shaved. Please note that after being groomed a shaved cat that has acces to a garden or balcony must be able to go indoors as it pleases (during each season). Also make sure the cat is kept warm during the trip home after the shaving session. Loose hair will be removed manually. This is only possible if there are no or just a few mats. If a cat has a very dense coat with a lot of onderwool (the soft fluffy hairs) that easily mats part of the underwool can be combed out where needed. It’s also possible to shave only the problem areas (for instance belly, arm pits, groins) and comb the rest of the coat. If the cat’s coat has gotten a bit greasy or dandruffy at the end the grooming session, the cat can be sponged down with a hand cloth, and dried with a towel. It’s possible to shower the cat with skinfriendly cat-shampoo, but this is not standard procedure because the washing itself and the dry blowing often means a lot of extra stress for the cat. Therefor this is only done in exceptional cases (!) and, for practical reasons, only in the salon. I also prefer to let the cat keep it’s own smell as much as possible. Especially if the cat is sharing its house with other pets. ~ The mileage fee for all appointments that do not take place in the grooming salon is € 0,25 / km over the entire route and two way. ~ Parking costs will be charged. Amsterdam-Zuidoost, Abcoude, Amstelveen en Ronde Venen-regio (Vinkeveen, Uithoorn, Mijdrecht, Wilnis), Baambrugge, Diemen, Driemond, Duivendrecht, Ouderkerk aan de Amstel, en the following area’s in Amsterdam: Buitenveldert, Rivierenbuurt, Diamantbuurt, Transvaalbuurt, Indische buurt, Oosterpark, De Omval & Spaklerweg-gebied, Betondorp, Watergraafsmeer, Noord en IJburg. Cats from outside these service areas are of course welcome in my grooming salon if traveling is no problem. ~ Amsterdam CENTER, ZUID and ZAANSTAD: there is a good cat groomer once a month in the shop Cats & Things. She also has a salon in WORMER (ZAANSTAD). ~ Amsterdam ZUID. Amsterdam ZUID now also has a cat groomer: www.thecatbarber.nl. She also has a salon in HEM (between HOORN aand ENKHUIZEN). 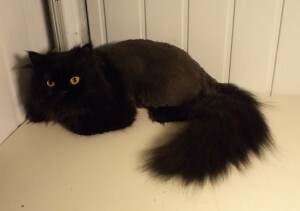 ~ WEESP/DRIEMOND: There is a new cat groomer (Yvonne from KatWijzer) who grooms at your home in Weesp and surrouding area. She not certified yet but far enough in her training to groom cats independently. Contact: info [@] katwijzer .nl. 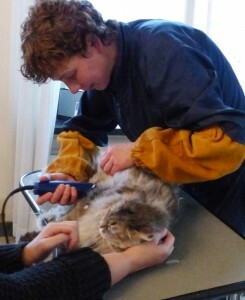 You can also look for the websites of cat groomers elsewhere in The Netherlands here, or contact your vet.